Monrovia, Liberia: Here, in the capital of Liberia, taxis filled with families crisscross the city, searching in vain for a facility with space to treat loved ones infected with the Ebola virus. Children orphaned by the disease and shunned by other relatives have nowhere to go. The government’s main hospital is plagued by floods and electrical fires, and several employees have succumbed to Ebola. The WHO’s description of the situation in Liberia echoed the warnings of aid groups such as Doctors Without Borders: that the outbreak is accelerating rapidly and slipping further out of control by the day. In Liberia, thousands of new cases are expected in coming weeks, the agency said. A team of emergency experts dispatched by the WHO to assess the situation in Liberia recently found a country overwhelmed by the crisis. When a treatment centre was hastily set up by the WHO for Liberia’s health ministry, for example, it had room for 30 patients but received more than 70 as soon as the doors opened. In Montserrado County, where Monrovia is located, the WHO estimated the need for treatment beds at 1,000; only 240 exist. The world appears to be responding, albeit slowly. The Pentagon announced on Monday that it would set up a 25-bed field hospital in Liberia to help provide medical care for health workers responding to the epidemic. A Defence Department representative said the $22 million (Dh80.74 million) hospital is being provided at the request of the US Agency for International Development, which is coordinating the US response. Defence Department personnel will not be permanently stationed at the facility, and after the hospital is established, it will be transferred to the government of Liberia, the representative said. The news marked a first step in President Barack Obama’s pledge over the weekend to use US military assets to fight the outbreak in West Africa. 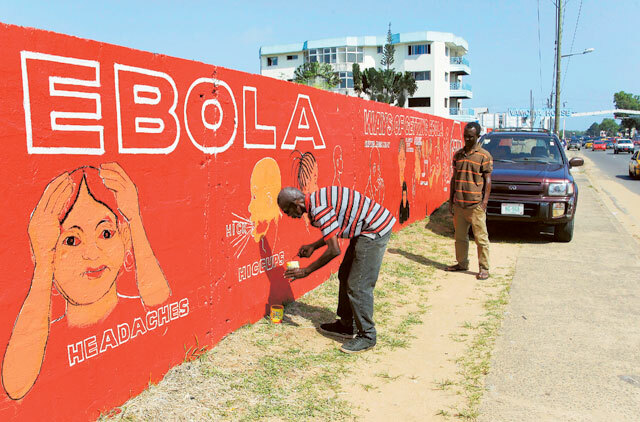 The British government said on Monday it planned to set up an Ebola treatment centre in Sierra Leone. The 62-bed facility will be built and operated by British military engineers and medical staffers and will be near the capital of Freetown. It should be operational within eight weeks, government officials said. In an interview on Sunday from Brussels, Brice de le Vinge, the operations director for Doctors Without Borders, the humanitarian group that has been the most active in the region since the outbreak early this year, said the situation in Liberia remains untenable. “We are overstretched physically, and we have people dying at our doorsteps every day,” he said. Caitlin Ryan, a field communications officer for Doctors Without Borders, said Ebola victims continue to turn up dead daily outside the gates of its 160-bed facility in Monrovia, some having died during the car ride there. Workers regularly turn away patients because of a lack of beds, sending them home with only a kit containing chlorine spray, masks, gowns and gloves, in the hope of protecting family members and other caregivers.